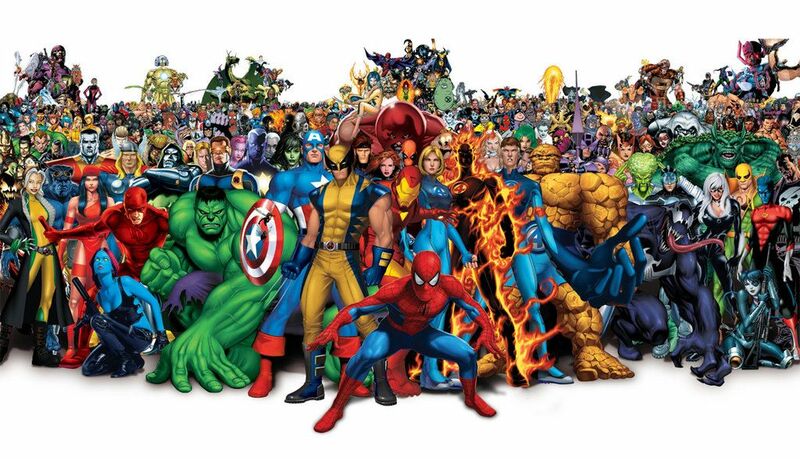 When many people hear the word “comics” they tend to think of superheroes. There’s nothing wrong with that, it’s just that comics can (and have been) so much more. Now I will grant that I have probably not been doing a very good job in dispelling this stereotype, after all this blog has primarily talked about superheroes, but I like to think of this blog as a way to educate and inform people about parts of comic book history that are a bit obscure and totally crazy. 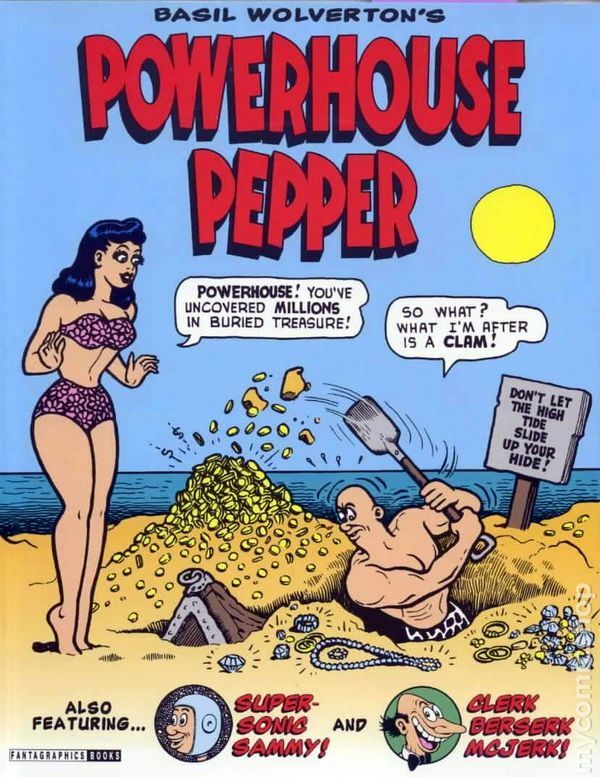 With that being said, let’s take a look at a character who isn’t really a superhero, but enjoyed a tremendous amount of success during the Golden Age of Comics: Powerhouse Pepper. 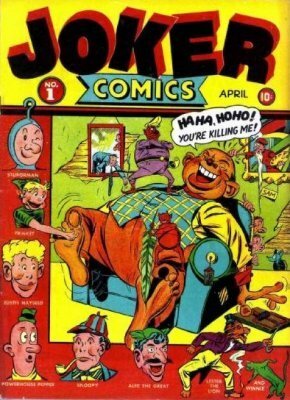 Powerhouse Pepper made his first appearance in Timely Comics’ Joker Comics #1 in April of 1942. I’m not going to lie, after looking at superheroes punching out Nazis for the past couple of weeks, this is a welcome relief. The character was created by comic book legend, and a man with the kind of name that belongs in a funny comic, Basil Wolverton. 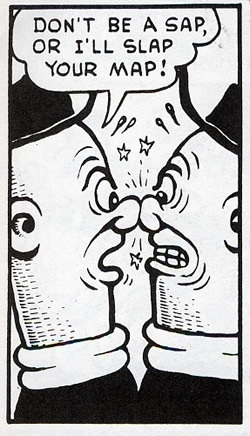 Basil is considered to be one of the great humor artists ever, and was dubbed the “Michelangelo of Mad Magazine” by the New York Times in 2009.
his signature creation was the dimwitted, super strong boxer with a heart of gold and a penchant for the ladies: Powerhouse Pepper. and even managed to get his own title for a little bit. As mentioned above, the man was a boxer and a very good one at that. While he wasn’t really a superhero, he certainly appeared to have superpowers, up to and including super strength and durability. The man was a lovable and dimwitted oaf, unconcerned with petty things like money or fame. He did have a soft spot for the ladies and did his level best to be as polite and chivalrous as possible, even if it meant taking on opponents three times his size. I would say he’s a Popeye ripoff, but what really sets him apart from everyone’s favorite spinach eating sailor is his penchant for rhyming and alliteration in his dialogue. These stories are absolutely hilarious and Basil Wolverton’s creation deserves to go down in history as one of the greatest humor characters ever created. Sadly, while Powerhouse has an impressive pedigree and the kind of history that should have made him into a timeless classic, the character’s exposure to modern day comic book audiences has been somewhat limited. 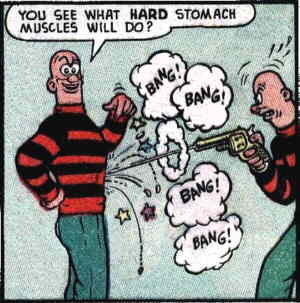 While you can find reprints of Basil Wolverton’s work, and there is a great website you can visit and view many of his appearances, Marvel has not bothered to reprint or promote any of the old Powerhouse Pepper stories. If you ask me, it’s a crying shame because from what I’ve been able to read, these stories are hilarious and still hold up today. Hello everyone. Normally this is the part of the article where I would ask you to support us on Patreon or donate to a Kickstarter. We don’t have those but instead we have a printed edition of our bi weekly web comic “The Secret Lives of Villains” available on for purchase on Amazon here. but depending on what state you live in it can either celebrate one of them, both, or every President who has been elected into office. but let me make my position on the matter perfectly clear. 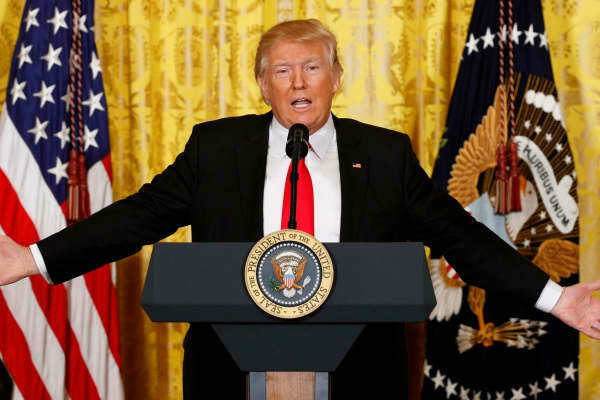 While it is important to realize that the position of President of the United States is a difficult one, and that we should honor the people who sacrifice their time and health to the job, the truth of the matter is that at the end of the day the President is an elected official who can, and should, only do so much. At the end of the day the problems that we face as a society can only be solved when ordinary people come together to fix them and take action. Solutions are almost never the work of one great individual, but rather a collection of ordinary people. Sadly, the slow and tedious work of millions is difficult to comprehend. So in order to make sense of it all we do two things. 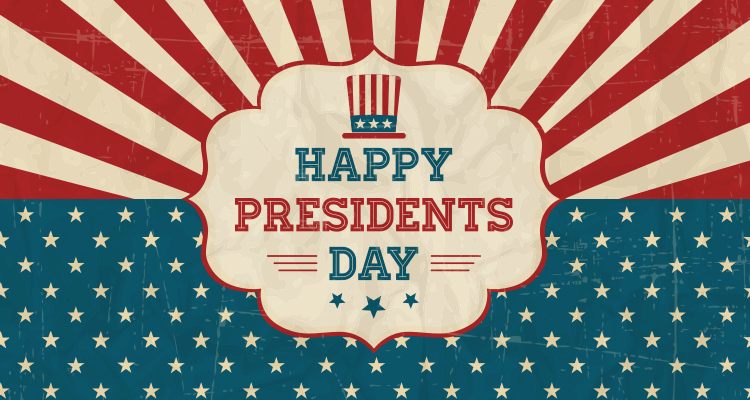 We celebrate the lives and achievements of a few men and women and we craft symbols and signs that we can rally around. 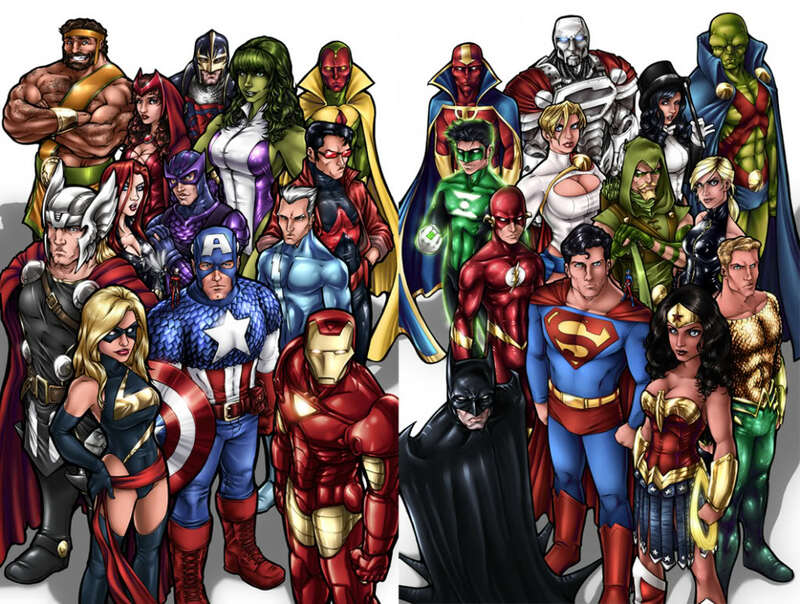 That is part of the reason why I like superheroes so much. They’re colorful, larger than life, and an easy way for people to relate to things and events that are much bigger than themselves. In an increasingly complex and chaotic world, they are the walking solutions to many of our problems. 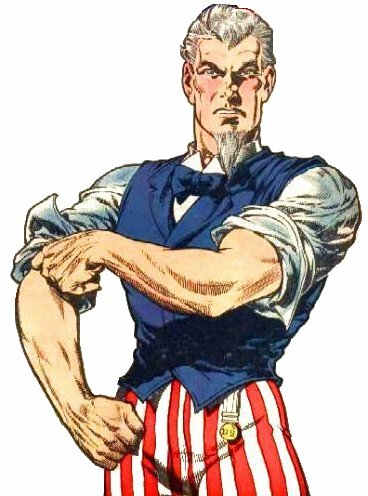 So let’s take a look at a Golden Age superhero who wasn’t just a superhero who represented the millions of men and women who fought in WW2, but a walking symbol of America as well: Uncle Sam. 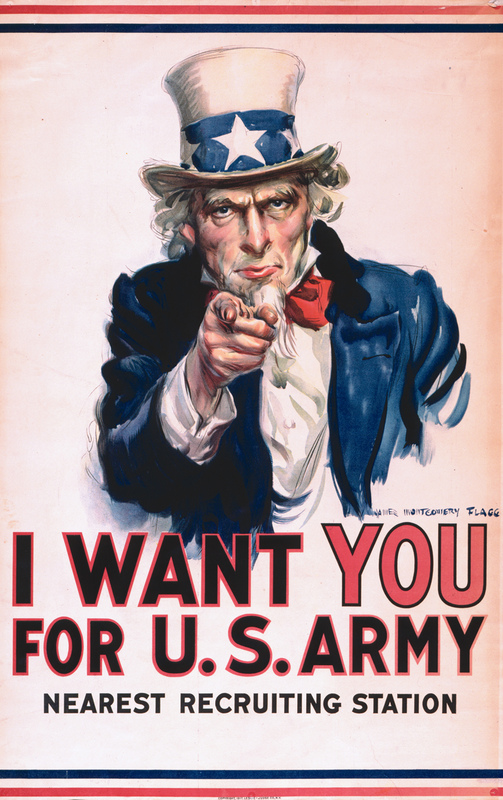 Uncle Sam became the personification of the American people and government during the War of 1812, although you probably recognize him more from his World War 1 recruitment poster. 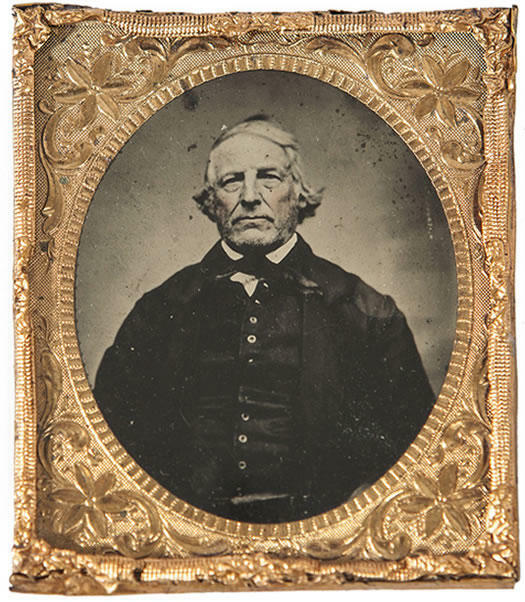 According to legend, the character of Uncle Sam was based off of the real life Samuel Wilson, who was a meat packer from New York and a fervent American patriot. 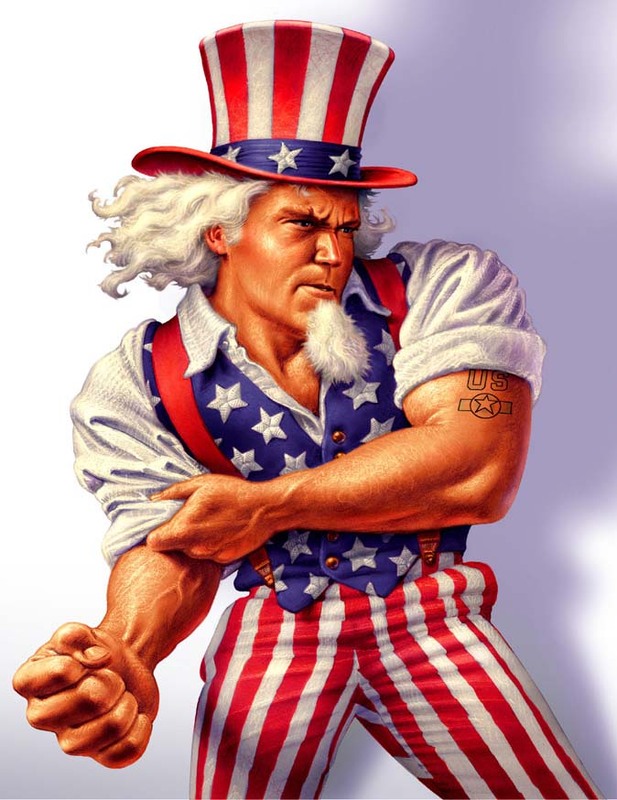 Uncle Sam is up there with the bald eagle, baseball, and the flag as great American symbols and since he has such a violent history and is often associated with war it only makes sense that when America decided to get involved during World War 2, they co opt the ever loving crap out of him. 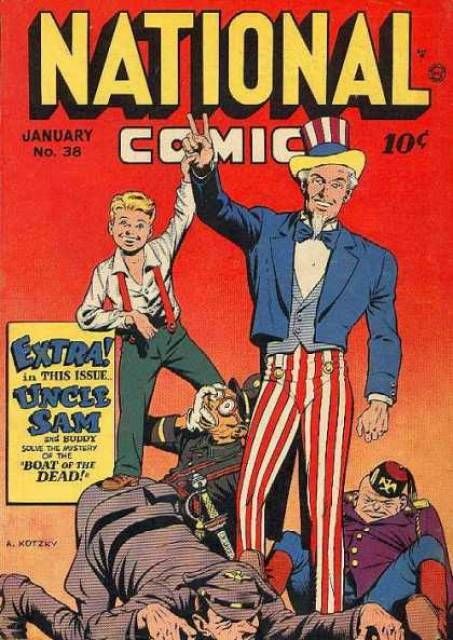 Naturally he found a home in comic books and in July of 1940, Quality Comics published National Comics #1 hit the stands with Uncle Sam leading the charge against the Axis. I don’t know what I like more, the fact that Uncle Sam’s hat hasn’t blown away in the wind, or that they have a LITTLE KID RUNNING ACROSS AN AIRPLANE WING ATTACKING A FULLY GROWN MAN ARMED WITH A PISTOL! Boy, child safety laws were pretty lax back then. Like every hero, Uncle Sam needed an origin story. It turned out that the folks at National Comics were content to keep him as a vague symbol of American government and way of life, only this time he was going to get his hands dirty and join the fight against crime and injustice. 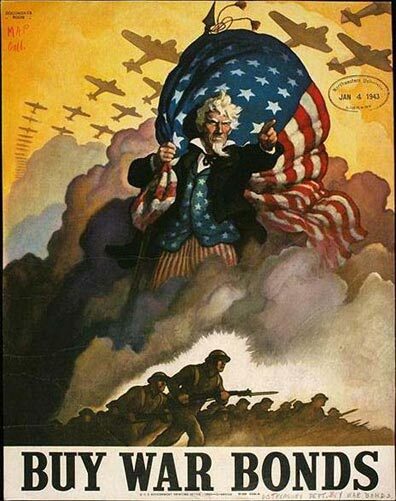 It turned out that Uncle Sam was the spirit of a fallen soldier from the American Revolution and continued to appear whenever his country needed him to fight. With any other company or creator this probably would have turned into a silly little farce, but this version of Uncle Sam was written by Will Eisner. 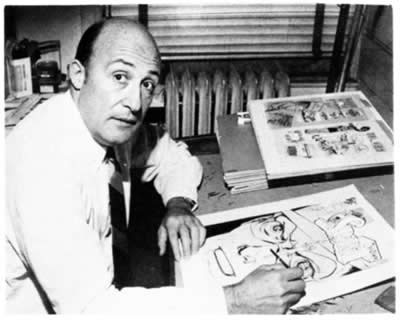 If you don’t know who Will Eisner is, all you need to understand is that the comic book industry’s version of the Oscars is named after him. 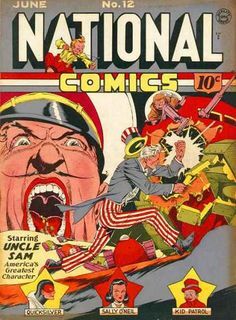 Anyway, this version of Uncle Sam did his patriotic duty and fought off, what else, the forces of evil and tyranny that just so happened to look like the Nazis. His superpowers were whatever the story needed and he had a kid sidekick named Buddy Smith who accompanied Uncle Sam on his many dangerous adventures. 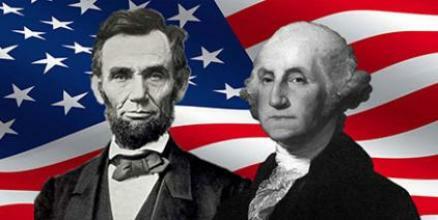 He spent 45 issues beating the enemies of America, and freedom loving people everywhere, to a pulp. Then Quality Comics went belly up in 1956 and was bought out by DC. 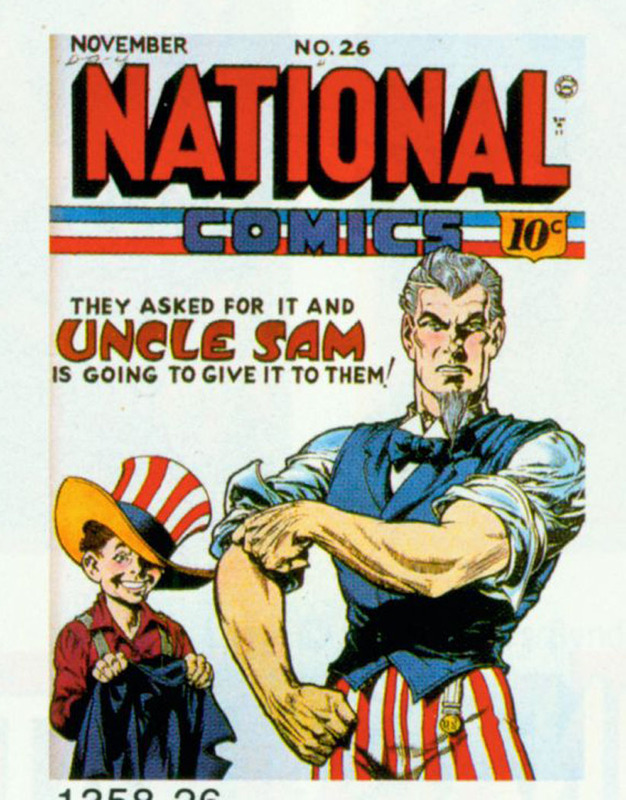 DC’s Uncle Sam would go on to be a pretty big supporting character in the DC universe. 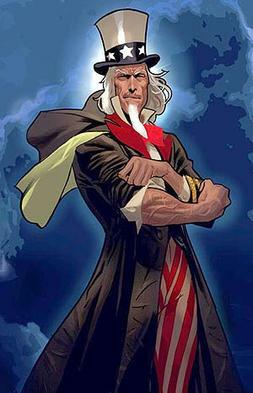 He became the leader of the Freedom Fighters, a group of old Quality Comics characters that were brought together in a Justice League type of arrangement. His origin was retooled a bit. Now he was a spiritual entity that was summoned by the Founding Fathers in an occult ritual that bound the “Spirit of America” to the body of a dying patriot. He’s had a steady presence in the DC universe ever since the 1970’s. 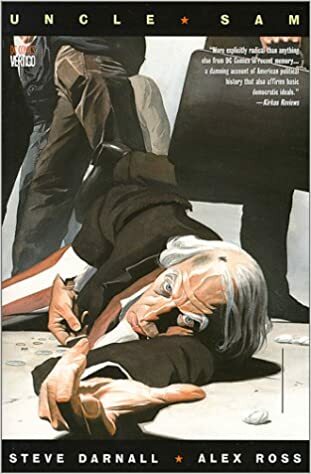 In 1997 DC’s greatest imprint, Vertigo Comics, gave Uncle Sam a two issue mini series written by Steve Darnell and drawn by Alex Ross. My hat is off to Vertigo for taking a pretty goofy character and treating him with respect and giving him a meaningful story. He appeared in the DC event comic Blackest Night. and was dramatically revamped as a mortal black man in the New 52 reboot. Uncle Sam is an interesting character. On one hand he’s goofy, colorful, and the kind of un ironic display of patriotism that would make a lot of people cringe. On the other hand he’s a symbol of a violent and destructive superpower that has a nasty habit of sticking its nose in business that it has no right to be in. Personally, I’m more inclined towards the first interpretation. Whether you love him or hate him, there is no denying that the man is pure Americana and I can’t think of a better symbol of the effort and determination of the American people. Sure, you can call me corny and cheesy but you know what? I’m okay with that. I said this year would be a bit different for this blog series by focusing on some of the more creative villains of the Golden Age of Comics and I intend to keep that promise. but even these guys were simply reduced to being cackling mad men who were given the simple job of being evil for the sake of being evil and crumpling like wet cardboard once the hero started punching things. It’s important to remember that during this time comics were built around the heroes and it was simply accepted that the hero always had to win. I’m not trying to mock the hard working and underpaid writers and artists who created these guys, it’s just that the comic book scene of the 1940’s and 1950’s was a bit different than it was today. and it’s pretty easy to see why creators didn’t really focus on making great bad guys. So here’s a blog post about an old foe of the Whizzer, Doctor Nitro. 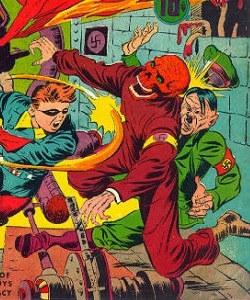 The evil doctor made his first appearance in U.S.A Comics #16 in 1945. He was so obscure and one note that this is the only photo I have been able to find of him. If I could describe the Doctor’s motivations in one word it would be generic. He didn’t have an interesting or compelling backstory, he didn’t have some sort of special mutant ability, and he wasn’t particularly memorable or crazy. While his motivations may have been generic, his methods certainly weren’t. The Doctor was an explosives expert (with a name like Nitro that really isn’t surprising) who developed a special explosive that could only be detonated by being exposed to a certain type of ray. Nitro manages to smuggle this explosive into his prison cell by pretending that it’s hand lotion and manages to escape after detonating a bomb that kills two guards. After escaping and rejoining his gang, Doctor Nitro planned on becoming rich by blackmailing the wealthy and elite into paying him or he would kill them with the explosive. The Whizzer witnesses one of Nitro’s henchmen kill a man named Standards and manages to trace the killing back to the Doctor. While Nitro does manage to douse the Whizzer with his special explosive formula the hero is just too fast for him and manages to round up the evil Doctor and his gang in order to save the day. Doctor Nitro was last seen in police custody, his current fate is unknown. How can he be remade/reworked? The Doctor was only given one appearance in 1945, he didn’t have a career after that. So instead we’re going to try and remake/rework him for a modern audience and see if he could be a good fit for modern day readers. Honestly, I think this guy could work, mostly because during my research Doctor Nitro reminded me of this guy. That man’s name is Howard Payne. He was played by Dennis Hopper as the villain of the hit 1994 movie Speed. 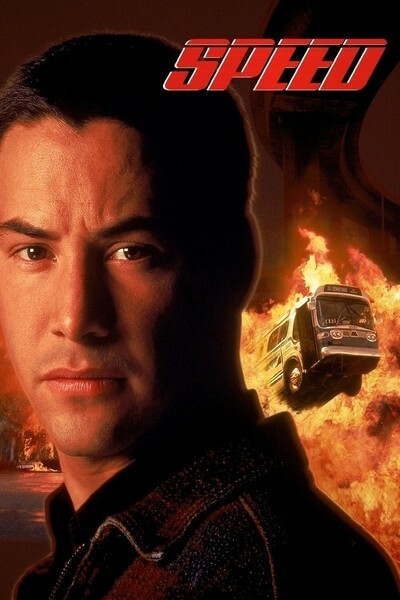 Howard is a retired bomb squad officer from the Atlanta police force who took a group of hostages on board an L.A bus and demanded a ransom of 3.7 million dollars or he would blow up the bus and all the people in it. Besides sharing similar motives with Howard Payne, Doctor Nitro shares a similar love for explosives and creative ways of blowing things up. What’s even better is that in the world of comics, Doctor Nitro can still fit in quite well. Personally, I wouldn’t change the character and motivations at all. He’s an incredibly talented bomb maker who has a knack for creating explosives that are undetectable and can be utilized in interesting and unorthodox ways. but I think the best place to put Doctor Nitro would be as a smart, capable, and behind the scenes antagonist to S.H.I.E.L.D. If I was writing him, the new Doctor Nitro would be half mad scientist, half bomb maker, and only interested in selling his services and products to the highest bidder. Perhaps he could have had a previous job as a scientist for S.H.I.E.L.D but decided that they didn’t pay him nearly enough and decided to go freelance. As for the villain’s tools, I think that he could not only be fun, but also pretty socially relevant. 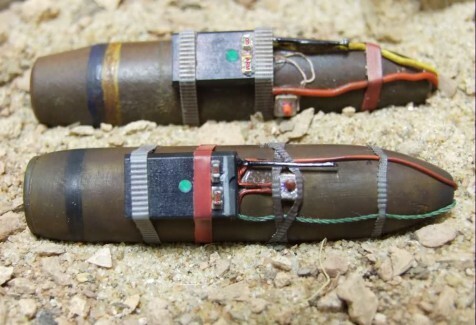 It’s no small secret that improvised explosive devices (IED’s) are a favorite and well known tool for terrorists in and around places like the Middle East, but with the new Doctor Nitro and his explosive expertise there is a whole new world of bizarre and interesting ways to challenge our heroes. For example, if Nitro’s explosive can be disguised as hand lotion, what’s stopping him from creating an edible explosive? If the charge doesn’t need a detonator to blow up maybe Nitro’s intended target could be killed off after eating a meal laced with explosives and detonated when exposed to a certain type of radiation? 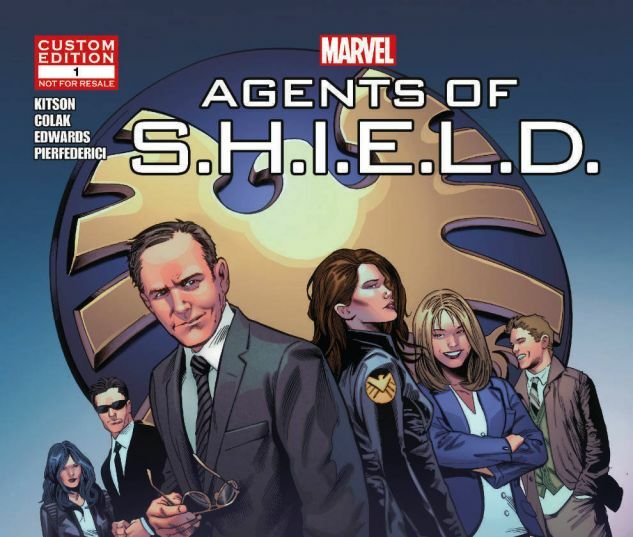 How would S.H.I.E.L.D manage to stop a bomb maker who leaves no trace and doesn’t work with conventional materials? There are plenty of interesting things that could be done with Doctor Nitro, it would be an absolute shame to waste him. Hey, thanks for reading! Just a quick heads up, we also publish a web comic called “The Secret Lives of Villains” ever Tuesday and Thursday and we have our first printed volume available for sale on Amazon! If you would like to support this blog, and read some pretty awesome comics, please feel free to pick up a copy here. Happy post Super Bowl everyone! Last night was one of the greatest games I have ever seen and I am so happy that my favorite team won their fifth championship. Full disclosure, I am a huge fan of the New England Patriots so I would like to apologize for anyone reading this who isn’t a football fan and has to put up with yet another half crazed fan talking about something that’s not that interesting. As for anyone who was hoping for the Patriots to lose, I’m not sorry in the slightest. The game was one of the greatest things I have ever seen, so I thought it might be fitting to talk about an old school hero named The Patriot. Look, it was either this guy or Sportsmaster and I chose him. 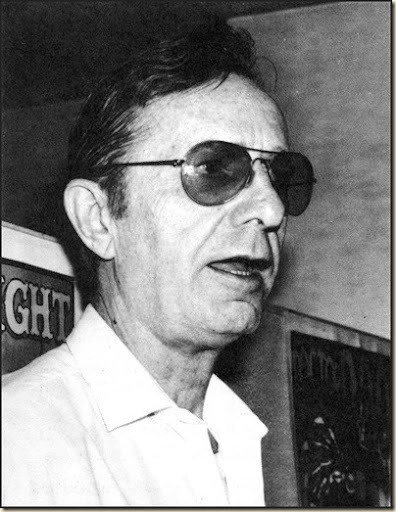 who was also the man who created Namor the Submariner. The character first appeared in The Human Torch #4 in April of 1941. Fun fact: the issue is rather famous for a printing error that stated it was issue #3 instead of #4. 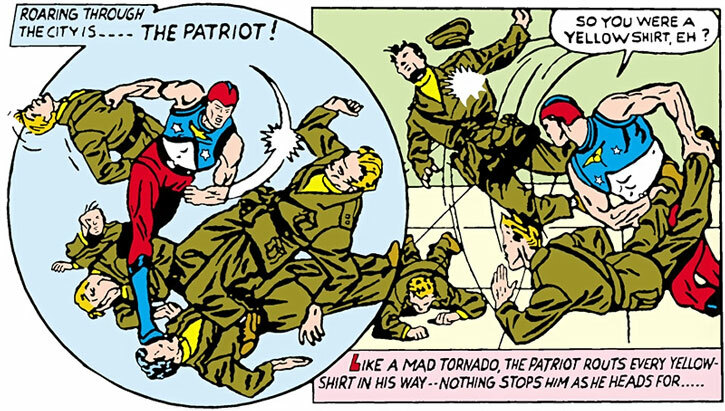 Anyway, the Patriot’s actual name was Jeffery Mace and his first appearance was in a ten page backup story titled “The Yellowshirts turn Yellow!” where the Patriot defeated a group of people looking to subvert the United States war effort by overthrowing the United States government. 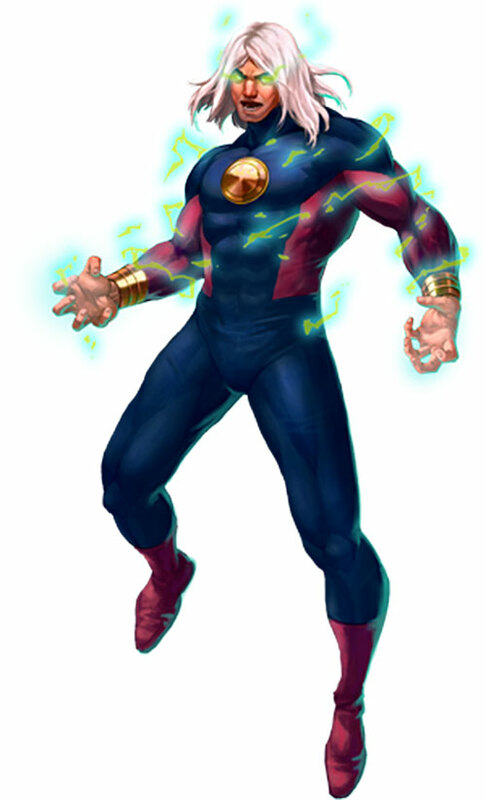 The character proved to be pretty popular for a backup character and would go on to have a successful, if not a bit standard and cliche, career as a secondary character in The Human Torch comics and Marvel Mystery Comics as well. 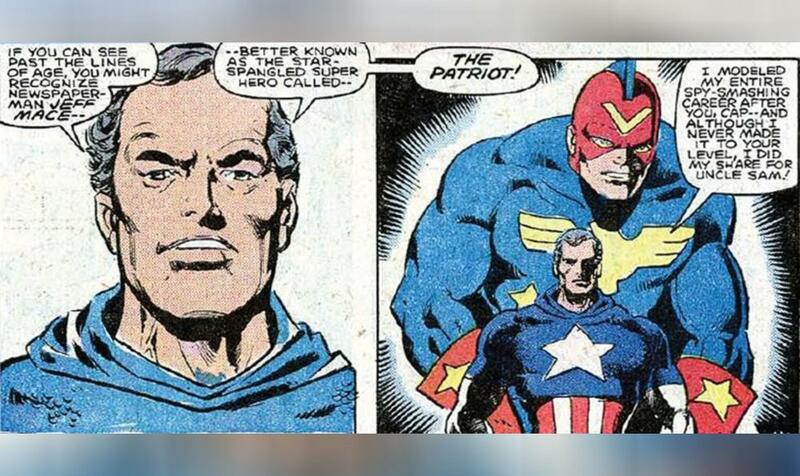 I like to think that if Captain America didn’t turn out to be as popular, the Patriot would have been able to become a much more established superhero. He wasn’t flashy, he didn’t have any special powers or particularly noteworthy stories, but he did his job and was popular enough to have a pretty long and storied career in the 1940’s. Life tip: if you want to survive through trying times, you have to be able to stand out so people notice you. 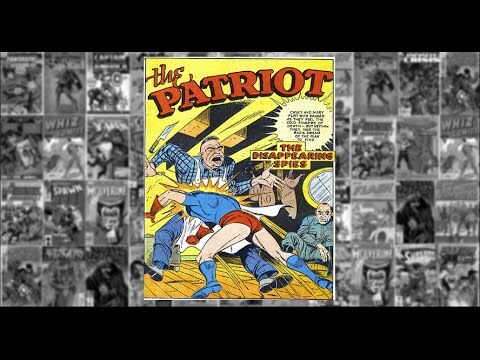 The Patriot did not have that chance and as a result died out with the superhero fad in the late 1940’s. With that being said, his previous popularity gave him something that a lot of his colleagues never had: a second chance. His first appearance was in The Avengers #97 along with his colleague in arms The Fin (the same guy we talked about last week) as a mental projection of Rick Jones in order to wage war on the Kree and Skrull. 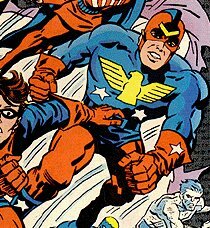 He wound up joining the retconned superhero group known as The Liberty Legion and was given a much more fleshed out backstory in the 1970’s. They gave the man a much more fleshed out backstory that gave him some much deeper connections to the Marvel Universe as a whole. In the new reality Jeffery Mace was a reporter for the Daily Bugle (Spiderman!) who was inspired by his idol Captain America. He even got to BE Captain America for a little bit when Marvel published a “What if?” story where he got to don the uniform of Captain America for a bit in order to explain how the hero could have continued to work after being frozen in ice. He was actually the third person to don the costume. 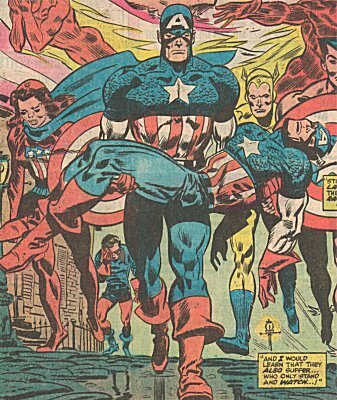 That’s him carrying the previous Captain America stand in, a hero called “The Spirit of ’76”. Jeffery had a couple of guest appearances after that and was killed off in main continuity in 1983. But for some wonderful reason, the Patriot still had some juice left in the tank. 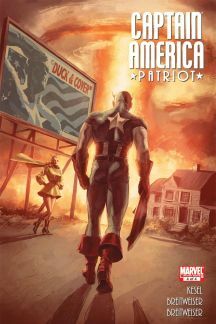 In the modern day Jeffery’s story was retold in a comic book series called Captain America: Patriot that took a closer look at McCarthy era America and superheroes who wear the red, white, and blue. His legacy lives on with a kid named Eli Bradley (the son of Isaiah Bradley from the excellent Truth: Red, White, and Black) working with the Young Avengers. Also, for the first time in this entire blog, I can say that we have a superhero who actually made it outside of comics and into the movies! 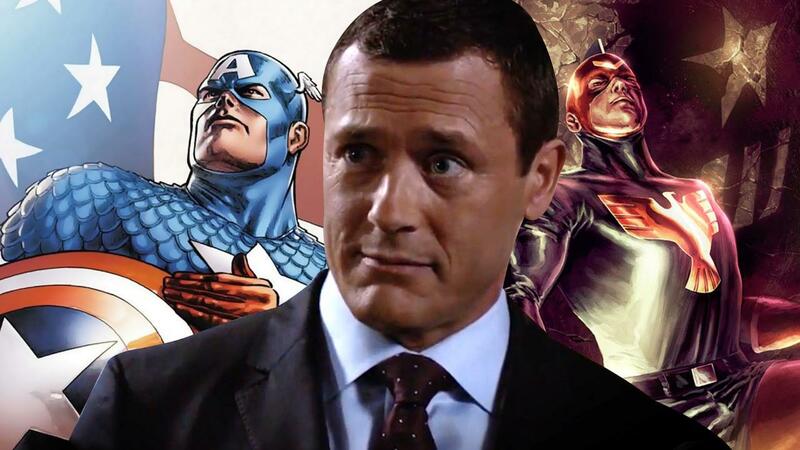 Jeffery Mace made it onto the Marvel tv show Agents of S.H.E.I.L.D and was played by Jason O’Mara. I won’t go into any further details for fear of spoiling the show, but I can say that he is one of the good guys and a friend to Coulson. The Patriot is as big, bright, and as dumb as they come. He wasn’t meant to be all that interesting, he was written to punch Nazis and fight during the war. What Marvel created was a patriotic mascot, what they got was one of the best and most sincere attempts to replicate Captain America, one of their greatest icons.